Congrats! You just bought your new RV and can’t wait to start planning your many adventures. Unfortunately for most, not everyone can go RVing full-time. And so for those of us who can’t, whether it’s due to work or family obligations, or it’s just too darn cold, knowing how to properly store your new RV is critical. There’s nothing worse than saving up and buying the RV of your dreams only to see it whither away with improper care. If this sounds scary and overwhelming, no worries; we’ve got you covered! Read on for 10 must-have tips to keep your new trailer or motorhome secure, clean, and ready for your next trip. This may seem like an obvious answer … where there is room, but there are some environmental concerns you should consider when picking your RV’s resting spot. You do not want to put your RV under a tree where sap and branches can damage the exterior. Also, try not to park it in weeds or tall grass as insects and critters can and will find it and try to take up residence in YOUR RV! If you are using a storage yard or indoor facility (as shown above), make sure it is a secure location and double-check with your insurance for “storage only” coverage. Both are well worth your peace of mind. Friends’/Relatives’ Property: Keeping your RV on a property with a friend or family member to watch over it can do a great deal for your piece of mind. RV Parks: This is a great short term storage solution. Monthly rates make this very affordable! The bonus of electrical hook-ups make this a great choice. Search Google for ‘RV parks near me‘. RV Storage Lots: For around $100/month you can find a great indoor or outdoor storage lot for your RV. Make sure to trust your gut feeling about safety when you pick the place. Search Google for ‘RV storage near me‘. RV Repairs & Maintenance: If you need repairs or maintenance, coordinating these with a time you would need to park your RV for a period of time is a way to kill two birds with one stone. Tucking in your RV while not in use makes the start of your next adventure much more pleasant. It may seem counterproductive, but before you store it, give your RV a good wash and wax. 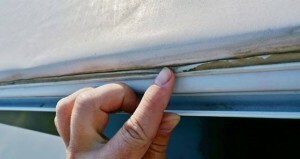 The RV wax will help protect your RV from sun damage and keep the dirt from building up. This makes clean-up after storage much less stressful and time consuming. Once it is clean, take a good look at the silicon seams, caulking and rubber seals. Repair any cracking or peeling (try an RV sealer) to ensure there are no leaks or ways for insects to make your RV their home. Damaged seals are invitations for leaks. Make sure and check and repair before you store your RV. Make sure you have good ventilation. 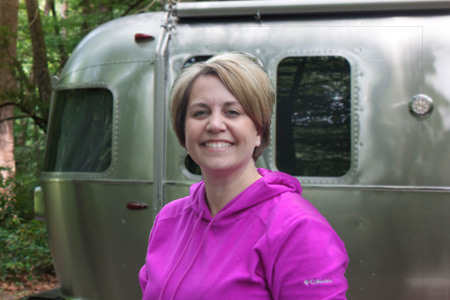 You don’t want to open the door to a moldy, musty smelling RV. Not a great way to start a vacation. A great suggestion is to leave the roof top vents open. With the right RV vent covers, you will get the air circulation you need without the moisture. Your first instinct would be to close your night time shades. Fight the urge! If you have a small leak, closing all of your curtains or using night shades will produce a dark, damp environment perfect for growing mold and mildew. Yuck! 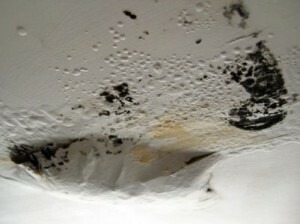 If you do happen to get a bit of moisture in your RV, light will combat the mold that could grow. No one wants to see this when they open their RV for the season! Make sure to retract all of your slide-outs for storage. This way the mechanical parts, roof, slide toppers and rubber seals are not exposed to the elements and there is less chance for leaks. Make sure to clean the rubber RV seals, roof and mechanical parts underneath. It is important to make sure all external openings are blocked off or screened. Popular spots for bugs to start a party are rooftop plumbing vents, inside the exterior fridge panel and vent, the furnace exhaust and air intake piping. Also, stuffing steel wool and spray foam into possible underbelly access points will help keep rodents (YUCK) out and away from making your RV their new home. Get rid of ALL food: Avoiding temptation for those pesky RV invaders. Set out bowls of moth balls to deter rodents: They don’t like the smell. Seal access holes around tubes and hoses: You would be amazed at how small of an opening a rodent can sneak through. Seal your firewalls: A scrap piece of metal over the gap will save you the pain of a rodent taunting you from inside your RV next winter. Make sure your RV “Deep Cycle” batteries are fully charged before storage. No one wants a dead battery when they are ready to go on vacation! Also, having the battery fully charged will assure it doesn’t freeze in cold weather. Once you do that, use the battery disconnect switch to make sure all power sources are disconnected. If you do have an RV solar power source, leave it plugged in to maintain the battery at full charge. It will feel really good when your RV starts right up in the spring. 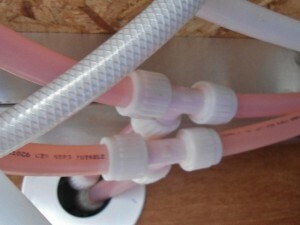 If there is any chance of freezing you should remove ALL water from the plumbing system including the water heater tank. Adding a bit of antifreeze into the piping, valves, drain “P” traps and a little bit into each waste tank will help make sure you don’t have leaks and broken pipes or hoses. How to Winterize Your Water System is a great step-by-step guide to assure you don’t have a disaster on your hands when you are ready for your next trip. Make sure your hoses are well maintained to ensure they don’t crack and leak. Winter is hard on everyone and freezing temperatures can be especially detrimental to your RV. No one wants to start the RV season off with a hefty repair bill. 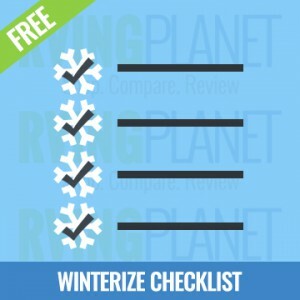 Don’t miss these great tips and helpful hints for winterizing your RV. 1. To Cover or not to Cover? 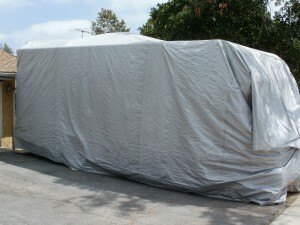 While it’s a pain to get on and off, covering your RV can save it from a lot of costly damage. Mother Nature is not always kind to RV materials such as plastic, fiberglass, rubber and vinyl. And the sun will take the sparkle and color right off your beautiful RV. 2. Remove EVERYTHING anywhere that has to do with food. And paper. Ok-pretty much take it out if it’s not nailed down. Pest likes to make nests out of anything they can find, and they are attracted to begin with by the food you forgot to take out of the pantry. 3. For you own safety and that of your nasal passages, make sure to clean out your fridge and freezer and prop them open to have air flow during storage. Keep the fridge and freezer turned off and doors propped open slightly to allow air to circulate and prevent mold buildup. 4. Lock it up! Curious neighbor kids, bored teenagers, and people that are up to no good are a threat to a perfectly tucked in RV. A great way to secure your RV better than the locks that came on it is to invest in a lock that goes around the kingpin. Pad locks and cylinder locks are great options. Here is a great guide to securing your RV. 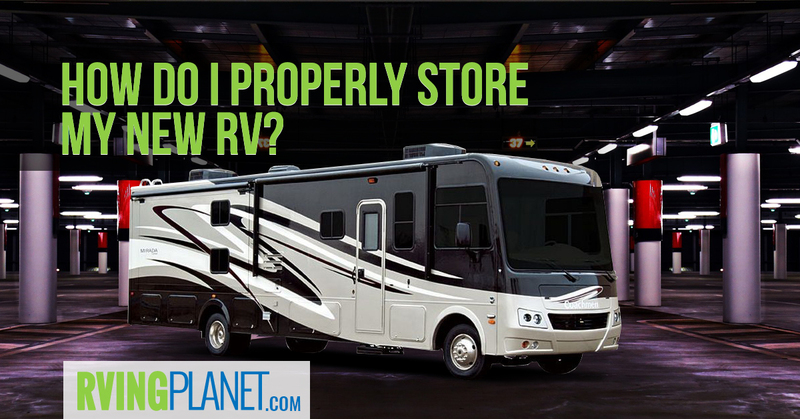 While the perfect storage solution would be to not have to store your RV, most have to park their RV at some point. Making sure your investment is well taken care of in the off months will make the time you have to camp worry free. With these handy tips, not matter where, when, or what type of weather, your RV baby should be tucked in nice and safe.